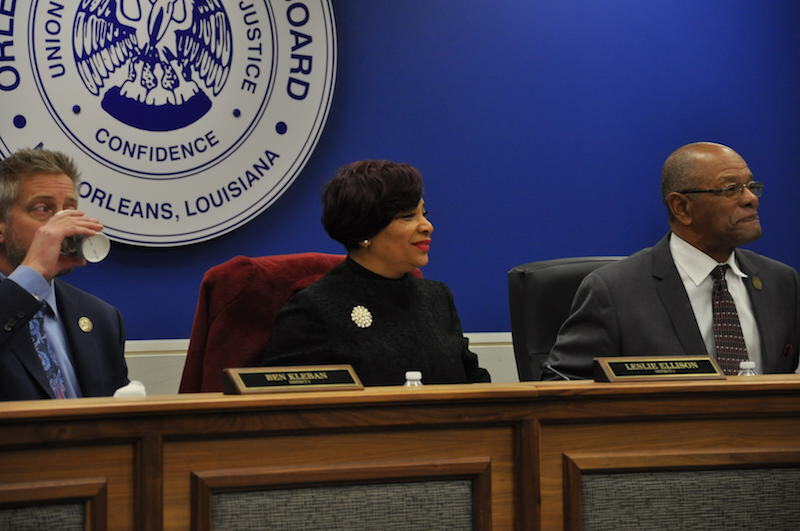 Orleans Parish School Board members Ben Kleban, Leslie Ellison and John Brown Sr. at the Jan. 17, 2019 board meeting. Edgar Harney elementary school employees will get paid next Friday, following board approval of a budget amendment that allows the district to recognize the students’ per-pupil funding. Payroll at the recently taken-over school was in question prior to the board’s vote Thursday night. A board committee meeting Tuesday didn’t provide any assurance as the members declined to endorse the district’s budget amendment request. The board room was packed Thursday night, but not for Harney employees. A contentious board leadership election simmering all week was decided in a 4-3 vote. Leslie Ellison, who has openly opposed adding specific protections into state education policies and charter contracts for LGBT students, was re-elected vice president. 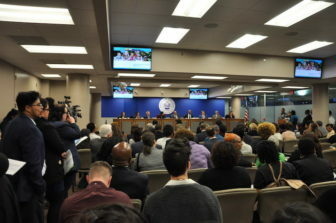 The Orleans Parish School Board\’s January 17, 2019 meeting included spirited public comment about who they would elect to serve as board president and vice president. Board Vice President Leslie Ellison, who has openly opposed adding specific protections into state law and charter contracts for LGBT students, was re-elected vice president. Ellison and long-serving member Woody Koppel were expected to be nominated for board president. But board member Ben Kleban kicked off the action items with a motion to suspend the rules that keep term-limited board members from being reelected. That allowed board president John Brown Sr. and Ellison to be renominated for their respective offices. The board didn’t take comment on the surprise motion. Generally, the board takes public comment on all items on which it takes votes. It did, however, take more than an hour of public comment on Brown and Ellison’s nominations. About 20 speakers voiced concerned about Ellison retaining her position as vice president. Some directly asked the board not to vote for her. About five spoke in favor of her candidacy. After the public comment period, board member Sarah Usdin nominated Nolan Marshall Jr. for vice president. Usdin, Woody Koppel and Marshall voted for him. But that fell one vote shy of Ellison’s votes from board members Ethan Ashley, Ben Kleban, John Brown Sr. and herself. The financial move at Harney doesn’t cost the district anything. It recognizes about $1.2 million in state per-pupil funding allocated to each student enrolled in Harney and adds the same amount as an expense to operate the school. The district took control of Harney during winter break after the Spirit of Excellence charter board, which ran Harney for years, surrendered its charter. On Tuesday, Chief Operating Officer Eric Seling explained the request to budget committee members. Former Recovery School District employee Lona Hankins criticized the district for waiting so long to approve a budget. She said the district should have created one in October when it first brought up the possibility the Central City charter school could close. The district plans to run the school directly through the spring, then close it at the end of the school year. “Your expenditures started when the janitors cleaned the school. Your expenditures started when the child was picked up by the bus. Your expenditures started when the teachers came to professional development,” Hankins said. She said the district — which has been operating Harney since the beginning of the month — was in violation of its own policy forbidding it from incurring expenses without an approved budget. Separately, the district is attempting to get about $419,000 in federal funds that were allocated to Harney. It’s unclear if they’ll be able to get that money as it was awarded to the charter group. The district also approved a donation from New Schools for New Orleans that will go directly to Harney teachers and staff that were rehired to finish the school year. The charter’s staff had to reapply to be hired as district employees. The district hired 27 employees back. They will each receive a $1,000 stipend from NSNO if they finish the school year. The nonprofit’s Chief Operating Officer Nash Crews said this isn’t the first time the group has provided this support in a school’s closing year.